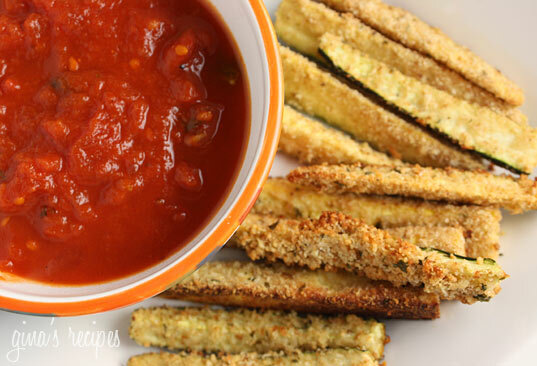 Baked zucchini sticks, a great way to get even the pickiest of eaters to enjoy zucchini! Perfect as a snack, appetizer or side dish. My daughter Karina loves when I make them, it’s her favorite way to eat zucchini and her only complaint is that I don’t usually enough. Because it’s zucchini season I thought I would revive these from the archives. I’ve been making this recipe for years, when Karina was younger it was my favorite way to make zucchini because I knew she’s eat them with no complaint. I serve them with warm marinara sauce on the side but that’s totally optional. Although the recipe is written for four servings, you can easily make this for one or two. A great way to get even the pickiest of eaters to enjoy zucchini! Perfect as a snack, appetizer or side dish. In a small bowl, beat egg whites and season with salt and pepper. In a ziplock bag, place breadcrumbs, garlic powder and cheese and shake well. Spray cookie sheet with cooking spray and set aside. Dip zucchini sticks into eggs then into bread crumb and cheese mixture, a few at a time and shake to coat. Place the breaded zucchini in a single layer and spray more cooking spray on top. Bake at 425° for about 20-25 minutes, or until golden brown. Serve with 1/2 cup marinara sauce for dipping. 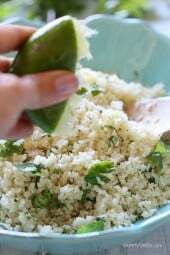 I had some zucchini in my refrigerator and was wondering what to do with it, so I searched your site and found this recipe. My family loved them! I cut and salted the zucchini to remove excess water before I made them and I did shake them in a baggie of flour before putting them in the egg bath. They turned out crispy and delicious. I may spice them up the next time I make them.. Thanks, Gina! Delicious as always! This recipe took a little finagling to get it juuust right but I managed to do it! I placed a baking rack on my cookie sheet to allow heat underneath the zucchini sticks and they came out perfect. Reminds me of mozzarella sticks and I could eat these all. day. long. They are delicious and flavorful! So if you made these and they didn’t come out the way you wanted, don’t lose hope! The recipe is spot-on, the cooking method takes a little experimentation depending on your tastes. 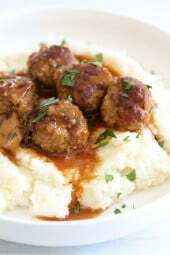 I plan on making these for dinner! Cooked these in the air fryer. They were nice and crunchy and delicious. I’ve made this several time and offer a couple tips: 1 – make thin wedges, too thick and they will not get crispy; 2 – I shake my cut zucchini in a bit of flour to coat before dipping into the egg (typically only a couple tablespoons of flour is enough); 3 – I find that I need to bake at 455 *F to get that crunchy outside. I also find I can use just two eggs including the yokes – but that does change the calorie equation. We adore this recipie and make it often in the height of zucchini season. Leftovers reheat well in the toaster oven. HAVE NOT TRIED THESE YET. THEY SOUND GREAT. AM DEFINITELY GOING YO MAKE THEM. I absolutely loved this recipe. Made it tonight to go with the Reuben Pork and can’t tell which one I loved more. Such a great side. Will absolutely make these frequently. I was disappointed in how these came out. The fries weren’t crispy and very little breadcrumb mixture stick to them. They didn’t get that nice golden color you had and were more on the soft side. 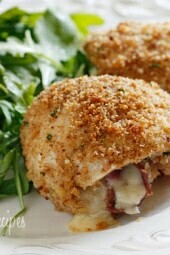 I just tried to make these tonight along with your baked garlic lemon tilapia. They both took me absolutely forever but I’m sure that’s because I’m new to cooking and to be honest neither of them came out great. I’m sure it’s my fault. The textures are off on both of them though. My fries are mushy. Any suggestions? I was going to try putting them in the air fryer to get them crispier because I put them in the oven a little longer and they’re not any crispier! Wish I knew why they didn’t stick! Well, my beloved “best cook ever,” a.k.a. Gina, the recipe has been reprinted and will be retried until I figure it out! This is because the one tray I managed to get in the oven was ABSOLUTELY AMAZING! The guys (husband and two boys) gobbled them up like French fries. So, clearly, it is something I’m doing wrong. I am going to try different techniques until I get it right! Sleep well, My Friend, YOU never disappoint! Cindy, I just added the video to the recipe on the blog….take a look! Keep me posted! Have you ever made these in the air fryer? can you use sqash instead of zuchinni? Just made these! I couldn’t find wheat bread crumbs, so I just used Italian bread crumbs. Then I made an unhealthy garlic aoli dipping sauce. Haha. These were delicious! So I’m confused here, is it 4 points for one whole zucchini? Gina, we have two of your cook books that I cook from and have never had a bad recipe yet. As an older male cooking at times became a little intimidating so my poor wife was stuck eating what I knew. Now she is much happier with your great recipes. Our favourite is the zucchini lasagna, so good. I had issues getting the breading to stick as well. I also noticed that about halfway through the mixture in the bag was getting soggy. Next time I will only put half the breading mixture into the bag then add the rest for the second half of the zucchini. These were fantastic, however. So good. We will definitely make them again and work on getting the breading to stick better. My breadcrumbs wouldn’t still very well. How long are you supposed to beat the egg whites for? About 10 seconds, not sure why? You can also flour them first to help the egg hold better. Hi. I have a air fryer. Do you think it would turn out the same as well in my actifry? I don’t have an air fryer, so I am not sure. If you do let me know how they come out! I tried these in the air fryer last week. I did them on around 350-375 at ~8-10min a batch (tossing halfway through). I was experimenting, so don’t remember the exact times but THEY WERE DELICIOUS. I worked in smaller batches and then after each was done, threw them all back in to get them hot… Although my boyfriend probably ate half of them before I managed that last step. We made your Quick Marinara Sauce to go with them and it was a perfect pairing. These were delish!!!! I did peel all the skin off so the breadcrumbs would stick better. And best of all my picky little toddler gobbled them up! I told him they were French fries!!! These will be in my regular rotation. Thank you Gina!!! Thank you taking all the guess work out if dinner time…such a huge help to this working mom! Gina when I try to make these they come out very soft and almost soggy, any suggestions? Just made them for lunch today. As I was making them only for myself and I now regret not making a double batch (I could have eaten it). I love zucchinis and am always looking for new ways to have them! This looks like a great idea – and so east too, which is nice! I’ve never had these before so it was a bit surprising to bite into them for the first time. There’s not a lot of taste to them so I would highly recommend making a delicious dipping sauce. I made garlic aioli. I used panko breadcrumbs because I wanted them to be crispy but I found it really hard to make the breadcrumbs stick. Some of them had none at all — I just sprinkled some over the zucchini in hope that it would bake into the sticks. I’m not sure if there’s a trick to making the crumbs stick. Maybe it’s because I used panko crumbs. I made these using italian seasoned bread crumbs and they made a good side dish for baked fish. Can I make these ahead of time and keep in the refrigerator for a few hours before baking? Made these tonight and they were delicious. Hubby liked them too. Made homemade breadcrumbs in my Ninja blender, worked great. This sounds so good. I see I can use gluten free panko but I also am not eating dairy. Is there a substitute for the cheese? Love this recipe! 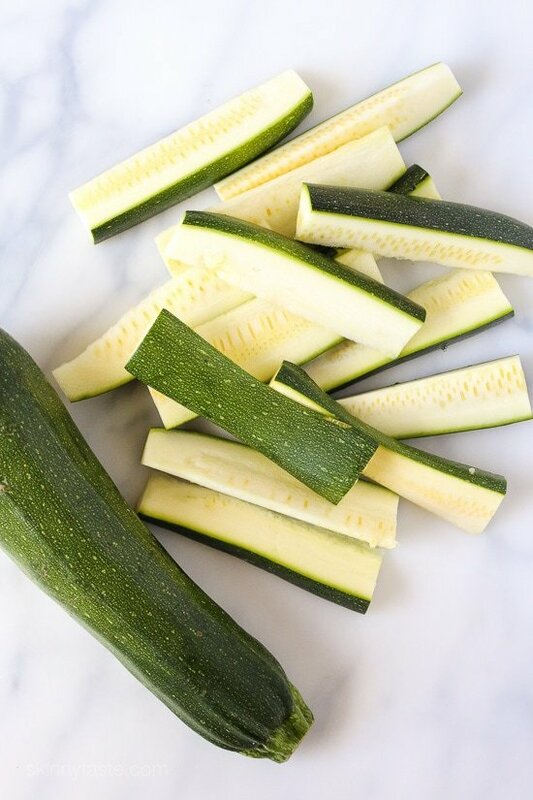 Quick question – do you try to squeeze out any of the water content from the zucchinis before baking? It doesn’t look like your sticks are soggy, so I was wondering if that is because of the high cooking temp or because you removed some of the water. Thanks!! I have your book and I read the recipes on line. Everything I have made has turned out well My only question is: What on earth do you do with all the egg yolks after you separate the whites and use them? Do the points include the marinara sauce? Better late than never….we just made these yesterday and they were delicious!! I want to use what I have at home already. What can I replace the bread crumbs and pecorino cheese with? Panko crumbs? We made these yesterday….and yes, Panko works just as well. I did add a little more of the garlic and some crushed red pepper after I breaded them for a little more bite. Seriously yummy! I think these sound amazing and I want to make them for my fiance and me! Any way I can make them vegan for my animal-loving man? Whipped aquafava (the liquid from a van of chick peas or beans) is a good substitute for egg white, but I haven’t tried it in this recipe. Love them!!!! Served with Baba Ghanoush as a dipping sauce. I actually stopped eating these to comment about them. AMAZING. Such a great use of zucchini! I stumbled upon skinnytaste by accident and am so glad! Thank you! made these last week. Delicious. Still a tough sell for all my kids- but one did enjoy them. Even better- my husband loved them- and he does not like zucchini. I ate almost the whole tray myself. Really works when you have a fried food craving. Felt like I was eating mozzarella sticks. Tried these so good but can't figure out why these are two points more then the eggplant. Where do you get the "seasoned whole wheat bread crumbs"? Do I make them myself, or buy them at the store? Thanks! These are awesome. I didn't have wheat bread crumbs so ground up some dry Pepridge Farm stuffing mix with Panko–to make a half cup of crumbs, with the rest of the ingredients in the recipe. I also used 2 egg whites. Instead of the marinara sauce I made a sauce I used a couple of nights ago that was popular with my husband and me. Equal amounts of mayo and low fat Greek yogurt to equal 1/2 – 3/3 cups, 1 T. of Adobo sauce from a can of Ancho chiles in Adobo, 1 T. olive oil and a large clove of fresh garlic, minced. 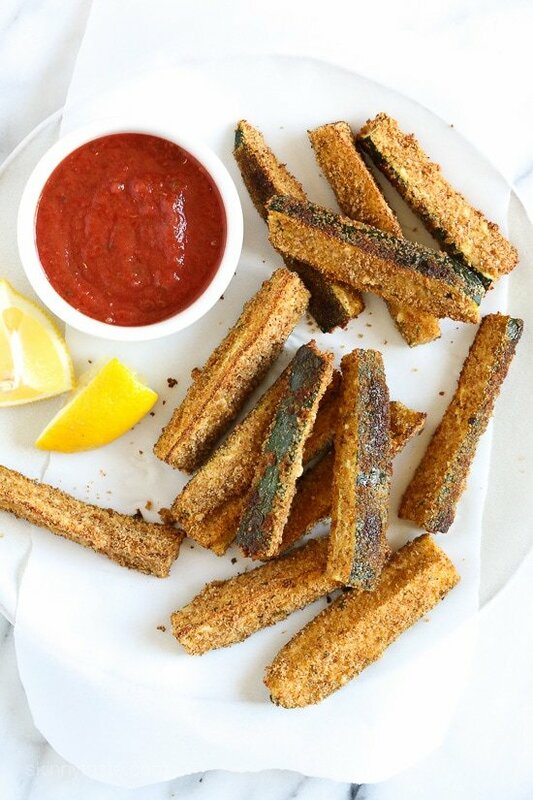 I love zucchini sticks but have only had them deep fried from a restaurant. This is something I am going to try. I have some small zucchini and that is something to do with them. thanks for sharing. Made these last night! Absolutely delish….they were gone in a flash. Family loved them. and I love that a whole zucchini worth of sticks is ONLY ONE POINT!!!! these were AMAZING! I used gluten free panko bread crumbs, and I have a sensitivity to eggs so I used olive oil, which is more points but well worth it. They were soooo good. They were a bit soft, i'm not sure if they were supposed to be crunchy but I would still make them again! And I will LOL! I’ve used milk or almond milk in the past in place of eggs. love your site! a quick question…the baked zucchini sticks recipe is the same as the baked eggplant sticks (except a little more breadcrumb), why are the point values different? 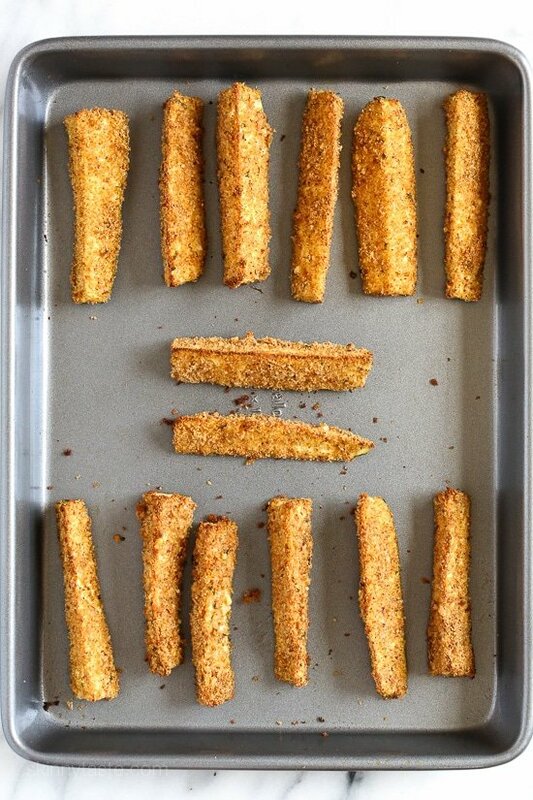 I made these just now…breading sticks well to the peeled sides but not the skin which may be expected. Next time I'll try pressing them a little harder while in the bag of bread crumbs. It's not the same as Red Robin but it's pretty good for homemade without being deep-fried and loaded with preservatives (as I'm sure Red Robin does).